Remember the Fujifilm X-Pro 1? Remember its mirrorless, 16.3-megapixel APS-C sensor and range of XF lenses? Yep, well look closely at the X-E1, because it's virtually the same camera in a smaller package. Miraculously, all the same controls are intact. As is the hotshoe. And the EXR Processor Pro. Yes, the 2.8-inch screen is slightly smaller, and the hybrid optical/electronic viewfinder has been replaced by an OLED one pushing out 2.36 million dots of resolution, but it's hard to fault Fujifilm for that. And in the spirit of consumer friendliness, there's now a pop-up flash. 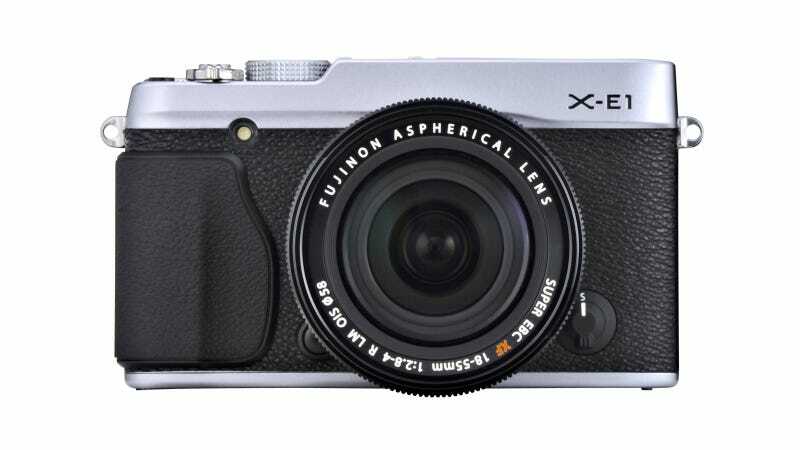 Like the X-Pro 1, the XE-1 has a full metal body swaddled in faux-leather that comes in your choice of all-black, or two-tone black and silver. It shoots 1080p video at 24p and has an auto ISO range of 200-6400 (25600 MAX). Plus, the battery is good for up to 350 shots. Also announced alongside the X-E1 are two new lenses. One is an 18-55mm (27-84mm equivalent) kit lens with an aperture ranging between F2.8-4. Fuji promises that autofocus and shutter speed will improve with this lens attached, which are two areas in which the X-Pro1 suffered. Meanwhile, the 14mm (21mm equivalent) F2.8 lens is a fixed length lens promising an ultra-wide angle and sharp images.